”My mother was Australian and my father was English, serving in the Royal Navy when they met at the end of WW2. They married in Australia and my mother went to England as a war bride. I was born in England in November, 1947 and we arrived in Sydney in August, 1948. My parents were very young at the time, Mum was only 19 and Dad was 24 and they arrived in Sydney with only 15/- in their pocket. They left England because Dad said it was an "old" country and that there was no future there, while Australia was still so "young" with the promise of a better life. Sadly, both of my parents are deceased now. 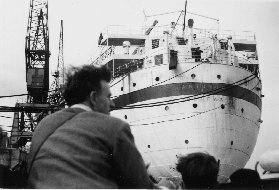 We sailed from Southampton on 8 July 1948 and called at Gibraltar, Malta (Valetta), Alexandria, Aden, Colombo, Fremantle, Melbourne and finally, Sydney. There were 1494 passengers on board (1170 adults; 297 children between 1-12 years; 27 infants). We were quite lucky because we had a cabin on the deck to ourselves while many other families had to share dormitory style accommodation. My parents did not know why they were given a cabin, but they were very grateful. My mother told me how hot it was when we passed through the Suez Canal and apparently everyone was sleeping in deck chairs on the deck trying to get cool. I was very taken with the stars, my mother said they looked so close, and I kept trying to grab them and making the appropriate noises a baby makes, which in turn disturbed everyone trying to sleep, so after about 15 minutes, we went back to the cabin. Apparently there were double decker bunks in the cabin and my mother placed me on the top bunk while she was changing my nappy. The ship lurched and I was thrown between the bunk and the bulkhead. Mum said she was terrified because I hit the metal deck with such a loud thump and didn't move or make any noise. She thought I was dead and went running to the "laundry room" to get my father who was washing nappies. He came back into the cabin, lifted me out, and I was perfectly alright. Mum wouldn't look at me until Dad assured her I was still breathing and OK. When the ship arrived in Colombo there were dozens of small boats that came alongside filled with food or souvenirs that the men in the boats offered to sell the passengers. They would hold up an item to show the passengers who would barter with them. When a price was agreed, a basket would be sent up to the buyer for money top be placed in and lowered to the men. When the men had the money they would put the item in the basket and send it up to the passenger. Dad told me he held me over the side of the ship in Colombo and offered me for sale to the men in the boats. When Dad offered me, they laughed and asked how much. Dad said £1 and they sent up a basket. Dad said "Money first" and the man said "baby first" and everyone laughed. Dad always said he missed out on a good opportunity to make some money!